File this one under 'essential'. Low price. Impressive sounds. Simple operation. Recreating the sound of their favourite producer is the goal of many an aspiring fader jockey. 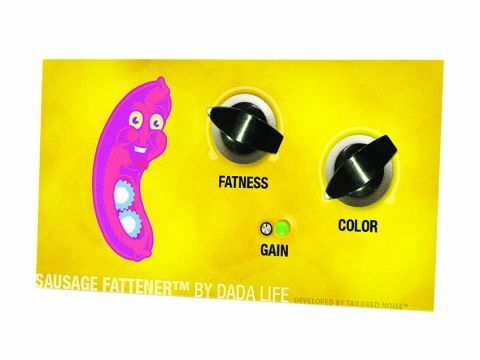 So when renowned dance production duo Dada Life teamed up with developer Tailored Noise to offer their sound in a plug-in called Sausage Fattener, we had to sit up and listen. "The effect is described as making things 'greasier' and 'phatter', and we'd agree with that." Sausage Fattener is a multi-purpose plug-in that offers fat compression at one end of the scale and full-on distortion at the other. There are just two knobs: Fatness, which can give weight and oomph to anything you throw it over (be that a bassline, drum bus or even master output), and Colour, which adds edge and brightness. The only other parameter is gain, which is important as the effect of the plug-in varies greatly according to signal level. Despite having only two knobs, you can get a huge amount of variation from the interaction between them. This can be further tapped into by adjusting the gain. We'd like to talk about the specific processes going on behind that cheery-looking sausage, but Dada Life and Tailored Noise are keeping tight-lipped. All they will say is that it's designed to reproduce the gear/processes that always features on Dada Life tracks. The crunch, edge, bite, weight and, well, phatness it can add is incredible for channels or complete tracks - we've even automated it and used it as an arrangement effect. The effect is described as making things 'greasier' and 'phatter', and we'd agree with that. We could complain about the lack of level meters, the non-serious interface and any info on what the plug-in actually does, but that really would be to miss the point. Sausage Fattener is meant to be set by ear, to artificially beef up your audio for the greater good. And you needn't take our word for it, as other users are said to include Tiesto, Sebastian Ingrosso and Laidback Luke.